Good to great play-making returns thanks to unselfish passing. Not only did the Spurs end the Rodeo Road Trip on a high note by soundly defeating the Los Angles Lakers, they did it in quintessential Spurs fashion. For the game, they had 37 assists — the second most of the season and the most in any road game. That means the ball was moving. The NBA definition of an assist is: “A pass that directly leads to a basket”. But when it comes to Spurs basketball, sometimes you want to credit several of the passes made before the shot is actually taken. So lets take a look at some of the best passes of all types leading to a score. #1 This is the first play of the game and it consists of what appears to be a set play because Tony Parker does not come back outside but comes around deep as if he is going to the basket. But Dawayne Dedmon rolls off his defender and heads for the basket. And there it is, a perfect lob pass by Tony. #2 Here we see Tony bring the ball up and make a great pass between two defenders to Dedmon who drives to the basket and notices LaMarcus Aldridge open for a better shot so he makes a hockey pass around the defender. #3 Now we see Manu Ginobili bring the ball up on the run and make a bullet pass between three defenders to Dedmon who without even a dribble, glides to the basket for the dunk. 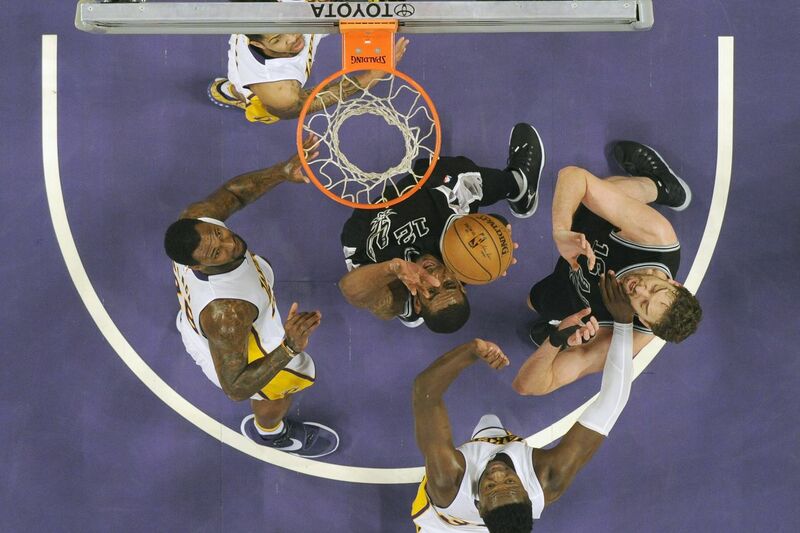 #4 This play begins with Pau Gasol at the top of the key where he hands off to Patty Mills. Patty passes to Manu who passes back to Gasol who is now wide open for the three point shot. Beautiful. #5 Here we watch Manu bring the ball up and make a deep pass to Patty in the corner. As Patty dribbles up, he immediately passes to Jonathan Simmons coming in towards the basket. #6 In this play, we see Pau with a hand off to Patty. As Patty moves farther to the right, he has a choice. He can pass to a rolling Pau or Manu for the three. The deciding factor was the defender that was on Manu originally is following Pau and thus leaves Manu wide open so he passes to Manu. #7 Here are two really good passes that are fun to watch in the same play. First is Patty with a two handed heave to Manu. The second is a Manu pass with more pin point accuracy demanded to Gasol who is waiting under the basket. #8 Now we catch up up with Tony making a steal, taking two dribbles and lay in a perfect pass to Danny Green on the break-away. #9 Watch this one closely as Dejounte Murray threads the needle to Kawhi Leonard who finishes with a dunk. For the night, Dejounte had four assists in eleven minutes. #10 To finish up, lets watch Kyle Anderson take the ball in deep and pass out to Davis Bertans, who by the way is wide open for a three but instead sees David Lee closer to the basket and chooses to pass him the ball for the dunk. Now there is a team player…Davis Bertans. In summation, great passing is essential in all aspects contributing to Spurs scoring with the exception of foul shots and one on one play. And those exceptions by themselves…will not win many championships.